Being asked to be someone’s bridesmaid, or more specifically their maid of honour is a huge honour. It not only highlights the strong bond you have with that person but also just how much they trust you because let’s face it, it’s no easy job and will no doubt be up there with the bride herself on importance. So to ensure things go off without a hitch, we thought we’d put together a little guide to being the best maid of honour possible! Enthusiasm – if you aren’t the wedding type, being enthusiastic when talking about bridal gowns, wedding colours and flowers is an absolute must. You may find yourself super surprised at just how much planning their big day will take over their life but it’s your job to go along for the ride and offer your honest opinion on everything; after all, you mean enough to the bride for her to ask you to be right there next to her on her big day. 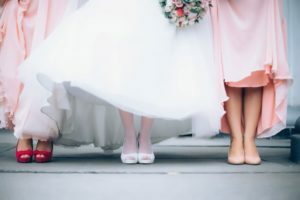 Be Her Wing Woman – it doesn’t matter how in love with their future partner they are, the moment before a bride walks down that aisle will undoubtedly be one of the most nerve-wracking of their life so it’s down to you to keep her as calm as possible. The best way to do this is to let everyone know that should anything need attention or should anything go wrong, you’re the first point of call to help her avoid any unnecessary stress. Take A Stand – there’s nothing wrong with being assertive and being honest, tactfully of course. You’re there to represent the entire group of bridesmaids in discussions so if a bridesmaid dress has been chosen that hits a few bad notes with some of the others, there’s no harm in bringing this subject up gently and simply raising concerns. Perhaps diplomatically suggest some other options or alterations that could make everyone happy. Make Time – while it’s not your special day, it is your best friend’s special day so be sure to commit time and space in your diary for the bride to be to not only show that you’re there for her, but to ensure things are done in a timely manner. This will relieve a huge amount of stress for the bride to be. Of course, there will always be an occasion where you can’t make it for one reason or another and simply being genuine and upfront about this is all you’ll need to do. Make sure the bride knows just how much her big day means to you too. If you’d like a little more help with her big day, then simply ask our fabulous Angie, right here at That Amazing Place. Angie has helped a number of happy couples organise their day and will be only too happy to help you too.